WOW is this year flying by or what? I now have a O N E - Y E A R - O L D which we celebrated at the beginning of the month, it's nearing the END of October, and Baseball season is ALMOST over. Didn't it JUST start? I just feel like I can't catch up with anything right now. The laundry piles up, I still haven't completely unpacked from any of our travels. It seems like we are gone every weekend, which is great and all, but I am in serious need of a vacation. So the Dodgers made it to the WORLD SERIES and we are getting ready to head down to LA for the weekend to attend the games. If you want to follow along on my weekend feel free to checkout my insta stories because I will be documenting pretty much my entire weekend. (and snapchat probably too!) It's going to be INSANE. So the fam bam and I got shirts to support my brother-in-law from 500 LEVEL. We chose to go with the FLORO51 shirts the first game.. because SO CUTE. 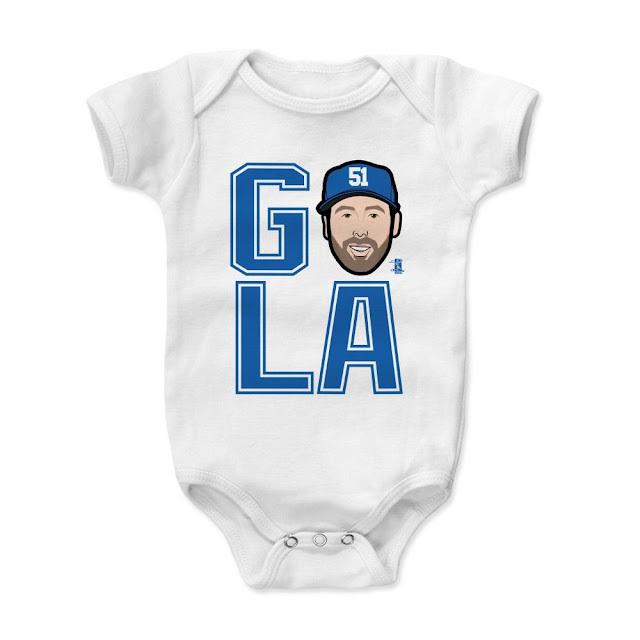 We also got Kenzie bug this GO LA with Dylans face on it, which I think is HILARIOUS, and not going to lie.. I kinda want this one for myself. There's so many fun designs, I want them all. Of course they have other players designs too, but I think I will stick to Floro. I may be biased! Ha. Part of the #FloroFanClub here! I also made this design for my deices sweatshirt. Are you a baseball fan? Who are you rooting for to win the World Series? We celebrated our little girl turning ONE YEAR OLD on Saturday. I still cannot believe a whole year flew by since we first met her. She has been the best GIFT to my husband and I. We just love her so much! 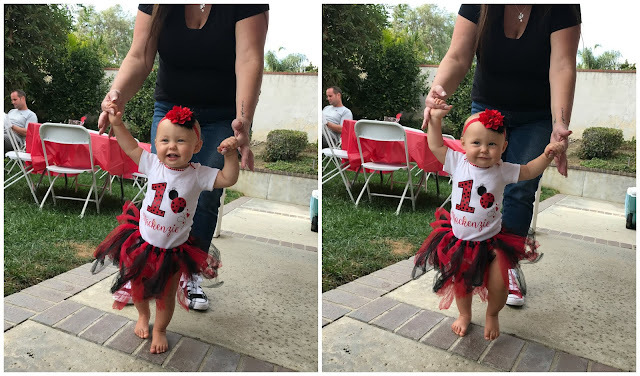 I started planning her first birthday a few months in advance. I knew I wanted to make my own decorations and really make it personalized. Since she was born, I made her "symbol" a lady bug. Long story short, I have always felt like she "saved" us. If I hadn't been pregnant last year in 2017, with my due date being October 2nd, my husband and I would have attended the Route 91 Music Festival in Las Vegas, which is where the Las Vegas shooting took place. I truly believe she had saved our lives. 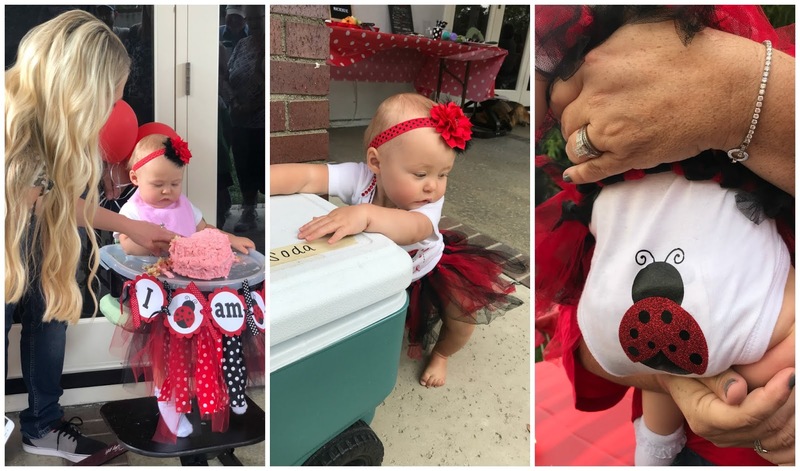 So I made her symbol a lady bug because she is our "good luck" charm. Ever since she was born I've signed her name with a little lady bug next to it. 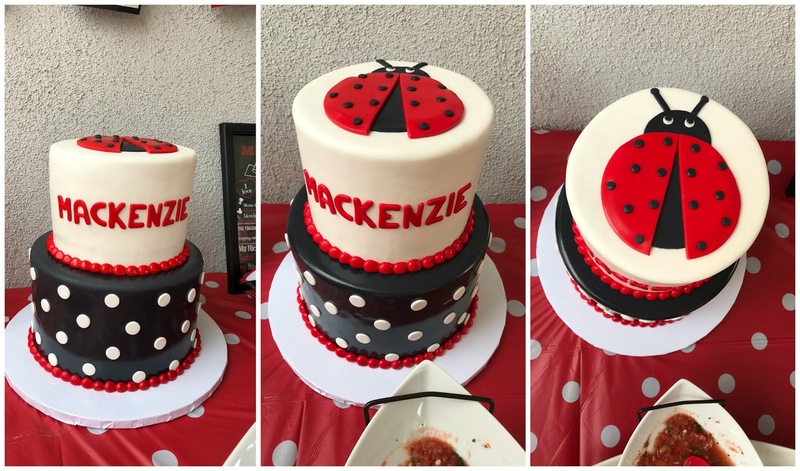 (We also call her "Kenzie Bug") So I felt like it just fit perfectly and decided to make her first birthday theme a lady bug theme. I know not everyone knows the story of why I gave her the symbol, but it is sentimental to me and always will be. We had the party start at noon thinking she would have had her morning nap and been in a good mood by the time people arrived, but she was much too interested in what we were doing. It was almost like she wanted to get this party started! Guests started arriving and we were a little scrambled getting appetizers finished, but everything ended up turning out great. We did, however, forget to bring out the fruit and vegetable tray until an hour after it started and we completely and TOTALLY forgot to bring out the 7-layer dip. (oops!) So we ended up devouring it days after the party. Total fail on our part! Oh well! We hired a taco guy, because who doesn't love tacos? And it made our lives so much easier by not having to worry about the main course. And they were of course DELICIOUS. Mackenzie ended up falling asleep after the party started, so I put her down for a nap and she ended up sleeping a good hour. Which is when I finally got to sit down and enjoy some tacos and appetizers. (YUM!) I also served margaritas because I figured they went perfect with tacos. I made labels for the drinks and of course forgot to put them out so one of my girlfriends accidentally served her 5 year old a few sips of margarita. (Another oops on my part). So definitely will make sure to label the drinks next time. We had about 66 invitees and around 45 showed up. It was a good turnout and I was able to spend time with people I hadn't seen in a while. 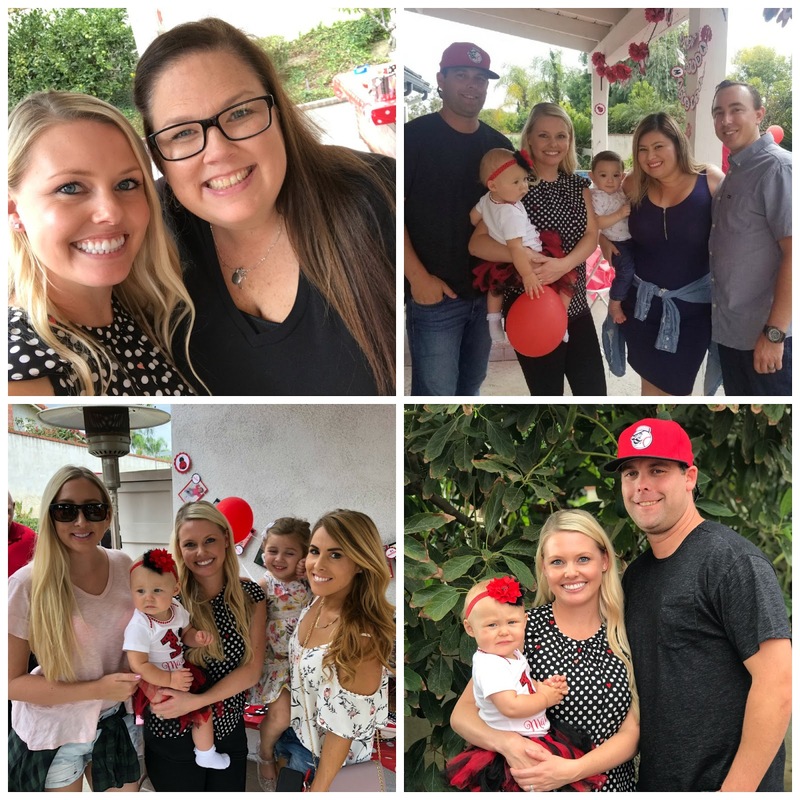 I tried making my rounds before Mackenzie woke up and I couldn't quite make it around to everyone and spend as much time with them like I had hoped, but overall I think I did pretty well considering it was a busy day. 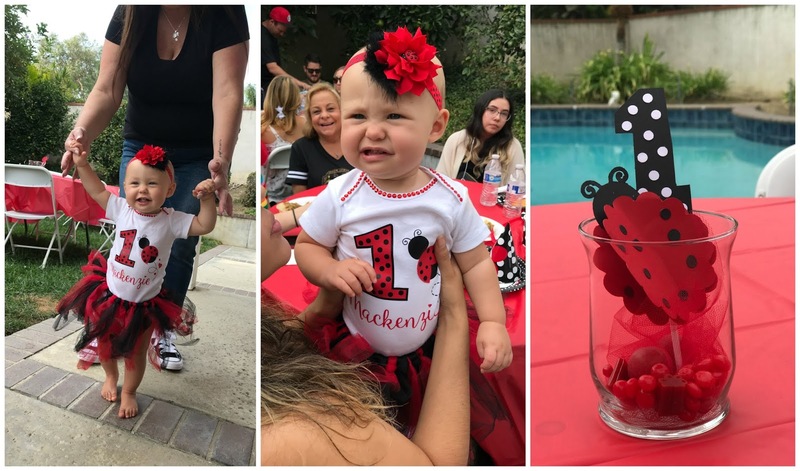 Once Mackenzie woke up, I took her around to greet her party guests since she didn't get to see everyone before she fell asleep. 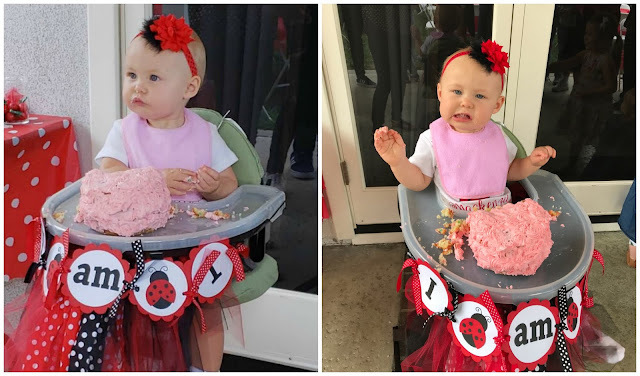 She wasn't quite sure what to do with the cake at first and why so many people were standing around her, so I started putting some frosting in her mouth so she could get a taste. She still wasn't sure what the heck was going on so my husband started smashing her hands on top of the cake, then she started getting the hang of it. 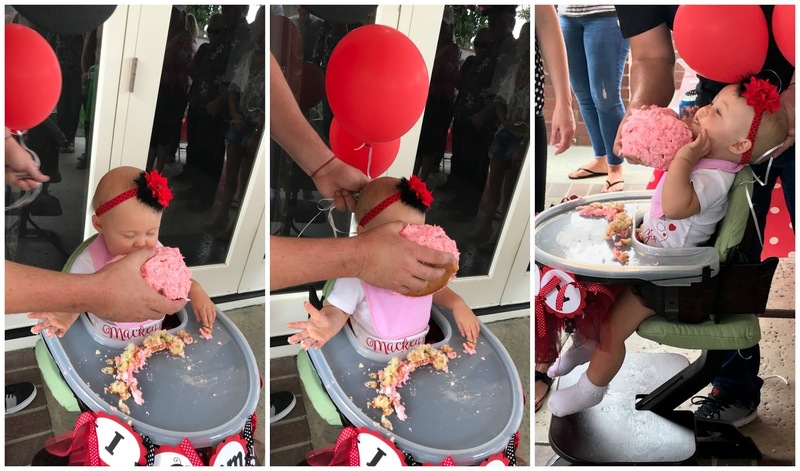 After a little while, my husband took the cake and shoved it in her face. She definitely does not like to get her hands or face messy that's for sure! After her cake smash we decided to the cut the ladybug cake. I had my cousin help cut it so I didn't ruin it! She did a fantastic job, by the way (haha.) The cake was so yummy! We ordered it from Beverly's Best Bakery. I chose the top layer to be white cake with raspberry fruit and buttercream and the bottom layer as chocolate with raspberry fruit and buttercream. 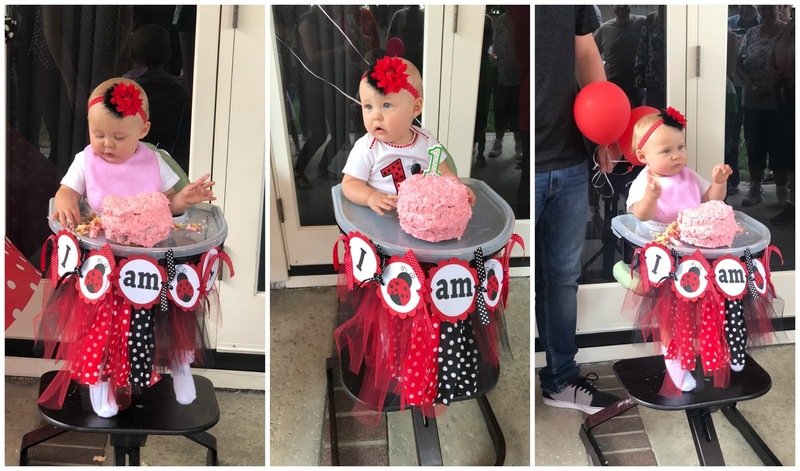 Her Birthday was so much fun despite all the work and energy it took to put it on. 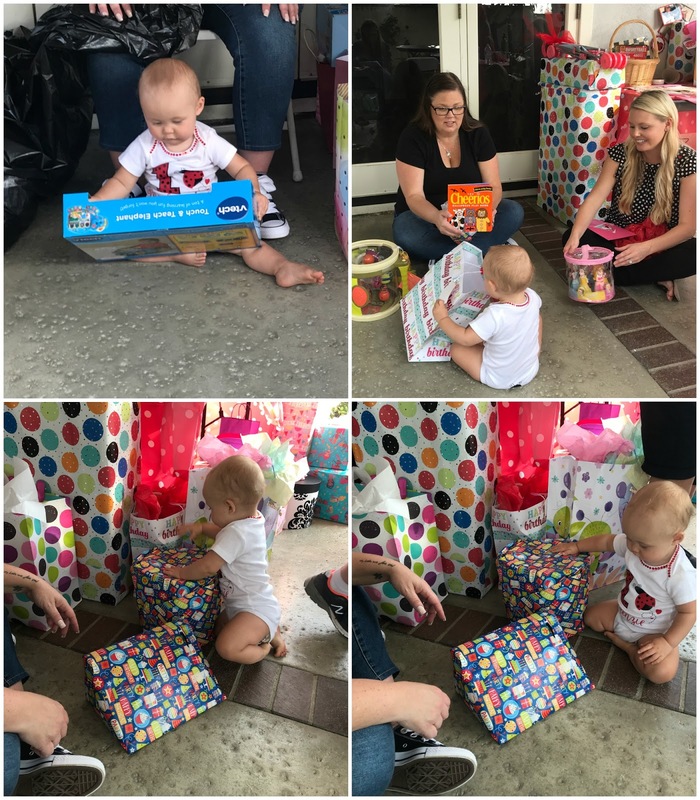 I think she had a lot of fun spending time with everyone, eating cake, and opening her presents. She got a lot of "Clock" gifts since she is obsessed with clocks. (Everywhere we go she points them out!) What a fun day it was! My husband and I are frequent travelers, and if you've been following me for a while then you know it's mostly Baseball related. We travel to my brother in laws games quite often during baseball season. 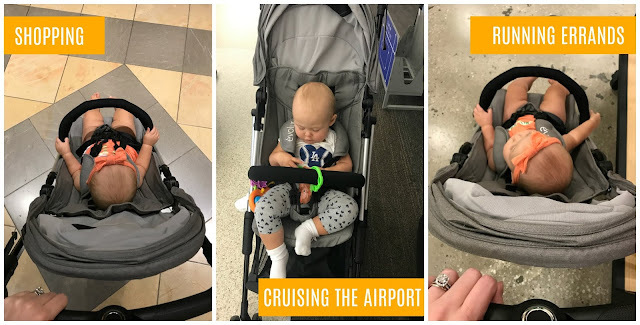 Now that we have our little bundle of joy, we needed a good travel stroller that was lightweight enough to travel with while also being easy to maneuver through an airport. 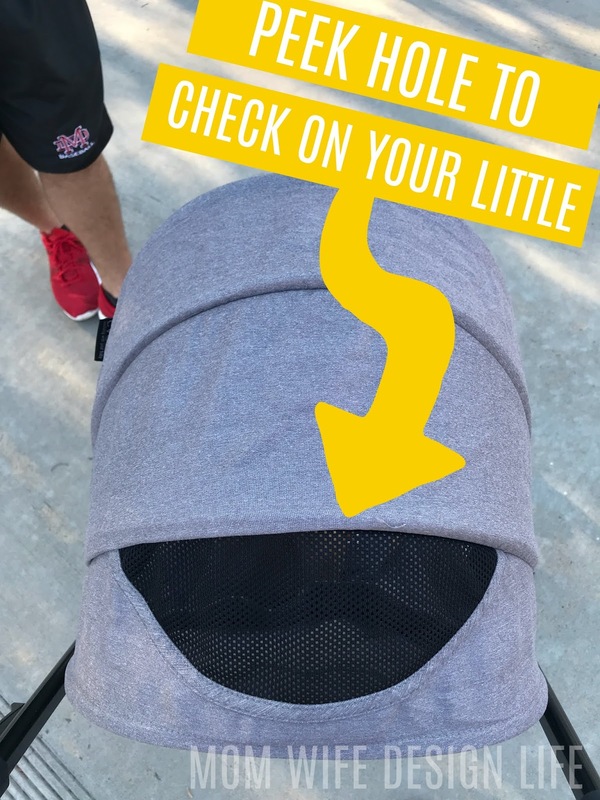 We used to take our large stroller with us, and while it's a great sturdy stroller with a lot of room for storage, it is more bulky and wasn't the easiest to fold up and take with us. I've been lucky enough to work with Evolur on numerous occasions after meeting them at a Baby Show in 2017. 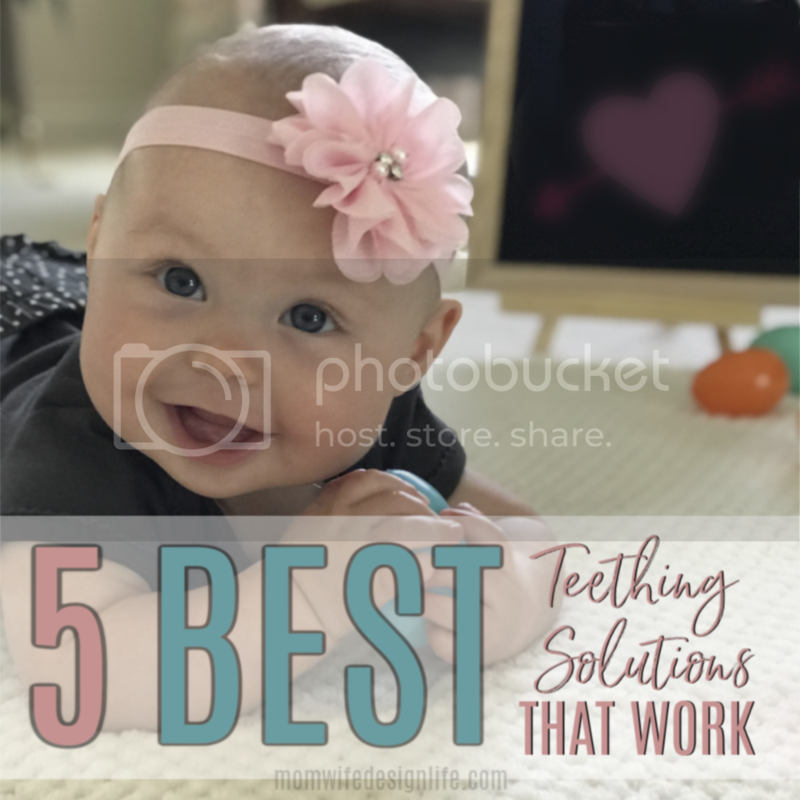 I initially fell in love with their furniture and ended up purchasing the Windsor Adora curved top crib, dresser and changing topper but what stood out to me the most was their customer service. 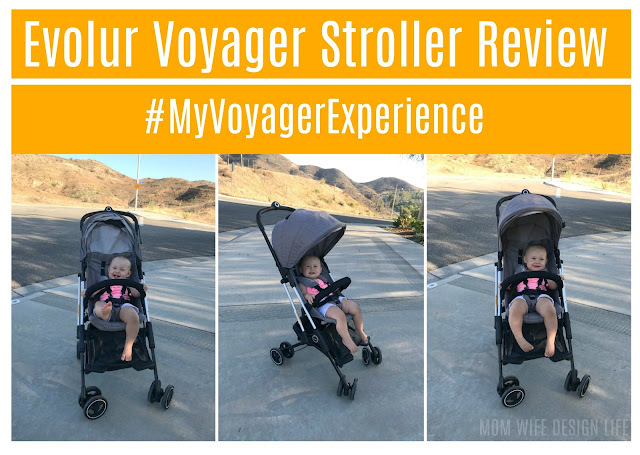 I was offered the opportunity to test out their Voyager Stroller and couldn't say, "Yes" fast enough. I already love their furniture products, how could I not love their new stroller? When the delivery arrived, I was surprised at how small the box was. I remember thinking, "There is No way a stroller fits in here." Much to my surprise, the stroller was folded up super small and perfectly packaged. I thought I was going to have to assemble it like the rest of our baby gear. Thankfully, I was wrong. This was the easiest item to open and it was already assembled. What mom ever has two hands available to fold a stroller? This stroller has a One-hand quick-fold design. Having this feature is a huge bonus, especially when you're hands are full with a baby. It has an easy to use button located right on the handlebar and folds super compact which is essential for travel. It an fit anywhere! 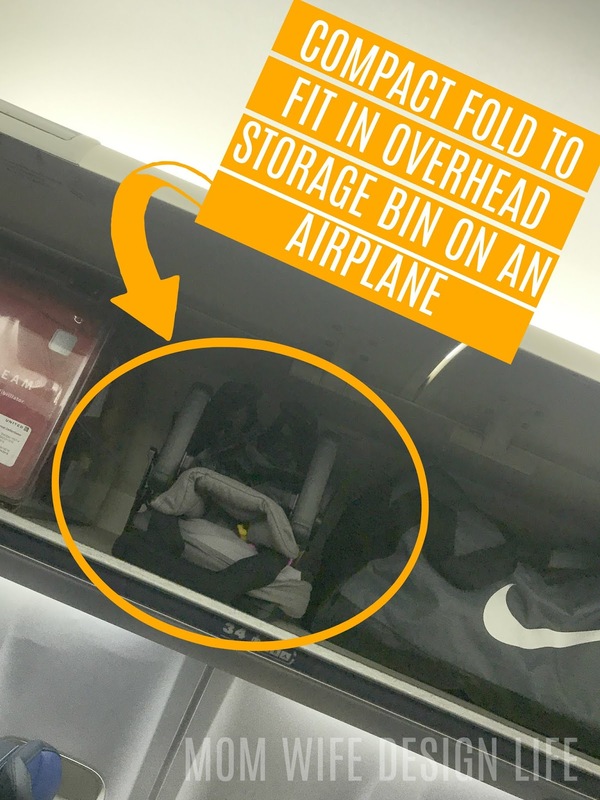 I even used it in the overhead bin on an airplane. I also love that it stands upright when folded, instead of falling to the floor. Which makes it easy to set down if needed without having to reach all the way to the floor. I also love that it is lightweight weighing less than 12 lbs. The Voyager stroller comes with a detachable Bumper Guard/Toting Handle which my little girl loves to hold onto while going for a stroll. When you fold the stroller, you can use this handle for easy, comfortable carrying. The stroller comes in two colors. I chose the grey as it is very gender neutral and we don't know what our next baby will be-when that time comes. The bottom storage compartment is large enough to carry snacks, drinks, toys, and any other goodies you don't want to keep in your diaper bag. So far I have used this stroller on our daily walks as well as at the airport. Let me tell you, people through airport security were AMAZED at how small the stroller folded to go through screening. Needless to say, this is THE stroller for you if you are a frequent traveler. What's not to love about a sturdy stroller that folds up this small with ease? This stroller would be a great item to gift for a Baby Shower. Every mom needs a lightweight travel stroller that's easy to use and lightweight yet sturdy. Those are hard to come by (and I've tested and shopped around for strollers often. I love finding THE best and easiest to use.) This stroller is hands down my favorite travel stroller. What is YOUR favorite feature of the Voyager Stroller?